Quilting Adventures: Rain, Rain and more Rain.....! Yep, that's been pretty much our weather as of late. 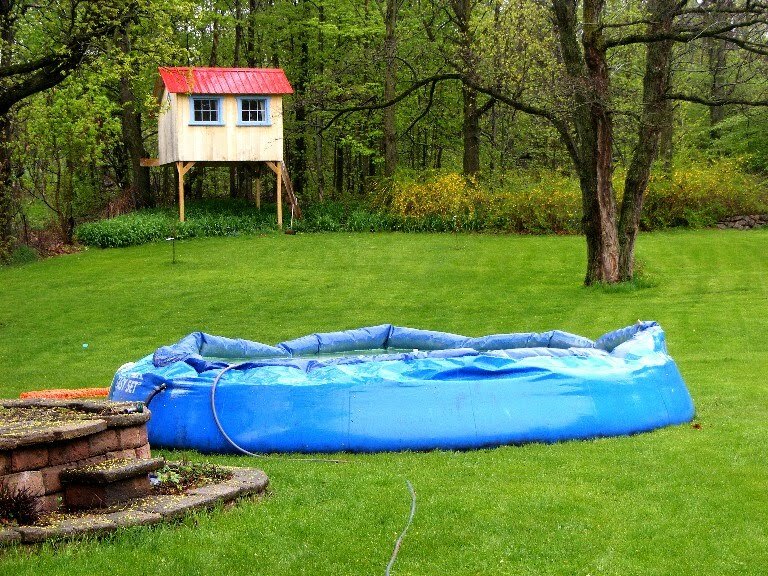 So, being of the "practical nature" kind of person that I am, I decided to make the best of it and put up my pool. Yep, that's right! Why not?! No, it hasn't rained that much but we have certainly received quite a few inches of rain. Given that the forecast is rain for the week, I turned off the hose and allow Mother Nature to do her thing! On the quilting front, I continue to keep myself out of trouble be productive and finished this little hand appliqué gem from the Fat Quarter Quilting Book by Lori Smith. The pattern is called Tumbling Leaves. It's been a flimsy for quite some time awaiting patiently to be loaded on Penelope. The dilemma was, how do I machine quilt it? After much thought, I decided to make it appear windy ...... sort of give it the blowing leaf look! I call it Blustery day! Cute little quilt--I love all things fall. And it does have a windblown look. Good call! Perfect choice for the quilting. I'd be saving that water too!!! I love the idea for quilting. It looks fabulous. Wonderful fall piece and the quilting is perfect for it. I am working on a braid piece, on my third row, then it is quits for today. I am so slow, lol. I got my snorkeling gear and rubber ducky waist floatie out now, just waiting to come over for a dip! Please let me know when the rain has filled your pool to the brim. 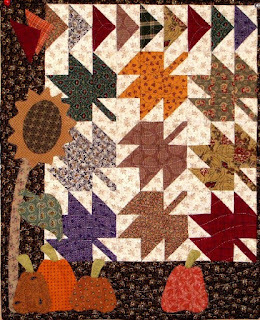 Tumbling Leaves quilt is adorable, Love those pumpkins! and the purple leaf!!!! thanks for sharing I think I have to get that book out! Do you have to pay for the cold water in the hose? Great name for the quilt, which is btw beautiful. Fall is my favorite time of year. My favorite color range. I like your Tumbling Leaves piece because of that.